In the 1980s Ry Cooder became known for his film soundtrack work, and indeed this lucrative side-line became in many ways much more successful for him than his solo albums of the 70s had been. He was no stranger to film music, having played guitar on Jack Nitzsche's soundtracks for Performance (1970) and Blue Collar (1978). 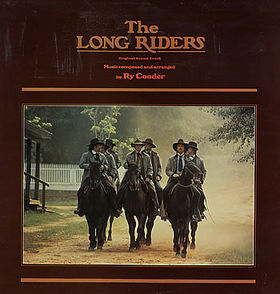 However the first time he was to be put in charge of a film's entire soundtrack was for Walter Hill's 1980 film The Long Riders, a western which told the story of the James-Younger outlaw gang. Cooder proved to be the perfect man to score the picture, as his knowledge and passion of American roots music served him well. The music he crafted for the film contrasted greatly with his own recording career, which at the time was focusing on electric rock music. For The Long Riders he emersed himself in old-time folk music, with a focus on songs from the Civil War era. It was authentic-sounding traditional music, but with unusual elements of Cooder's own design subtley blended in. Most of the soundtrack was instrumental, performed on a variety of stringed instruments, but there were some vocal tracks as well. Cooder only sang himself on one song. One of the songs, George F. Root's "Rally 'Round The Flag", he had originally recorded back in 1972 on Boomer's Story, but here it was given a much more exciting, joyful arrrangement. Likewise, the whole soundtrack was full of brilliant, innovative arrangements, brimming with atmosphere. Cooder approached this material as he had done the roots music of his 70s solo albums, updating it with fresh ideas yet still keeping it firmly and respectfully rooted in the past. The soundtrack was a resounding success, and pefectly fitted the film. It won Cooder the Best Music award from the Los Angeles Film Critic Association Awards. Released on CD, it made for a fine album away from the picture, another much-welcome addition to Cooder's extensive canon. It also marked the start of a new era for his career, as many more successful soundtracks would follow, and throughout the decade they would take up much more of his time than his solo albums. When travelling in the train, one of the gang members plays a Jews Harp and another sings a number, which includes the words, "My father he's a minister, And virgins he doth cherish…"
Is this a traditional number? Can you or a reader provide more information about the song, please? David, I'm not sure but I think that song is called "Jack O' Diamonds," of which there is apparently more than one song by this title. Actually, David, the song you refer to is an old marching tune called "The Girl I Left Behind Me"
"The Girl I Left Behind Me"—that's the one. Many thanks! ...but dang if I can find the version sang in the movie. As great as the movie is, they sure left a lot of good music off the soundtrack. Jack of Diamonds ain't on there either, disappointing.